The future is bright orange and a bit spooky! Booking now, our brilliant Halloween events are guaranteed to leave your visitors surprised and devilishly delighted. 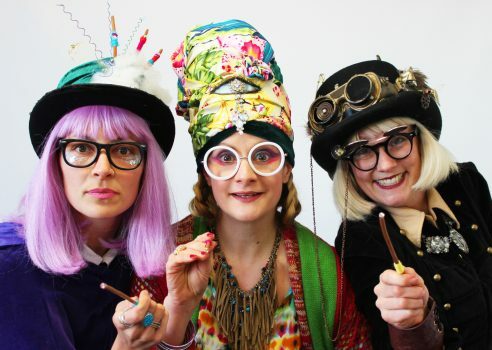 Will shoppers be met unawares by one of our troupe of wonky witches and wizards at the Witching Hour, a pop-up activation designed to creep into every nook and cranny of the shopping centre? Or will they enjoy cooking up ways to “out-spell” Marco Pierre Fright, the world’s most ghoulish gourmand, with a 12-foot singing toad in the Witches’ Kitchen, a fully immersive theatrical show right there on the mall? Alternatively, as a very special “treat”, shoppers may want to undergo a professional transformation in our Non-Beauty School/Zombification Station, complete with full theatrical makeup effects (just in time for the school run, maybe?). Or perhaps they want to get hands-on with our incredibly talented carvers and have a go themselves at creating a Jack O’Lantern that’ll be the envy of their street in a carving workshop in the Pumpkin Pimpin’ Patch. 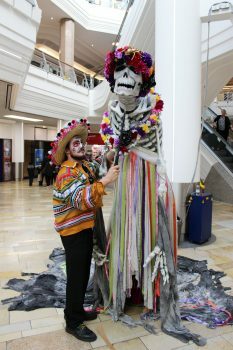 We love the Day of the Dead for its abundant colour and music and Bakehouse’s 10-foot skeleton never fails to turn heads as it leads the mariachi parade through the streets or along the mall. Our award-nominated Harry Potter inspired School of Wizardry – complete with broomstick-flight lessons, games for adults and children to play together and even visits from live owls – is a Halloween show-stopper for any centre. And the Table of Terrors delights and frights in equal measure when parents behold their children’s heads served up on a silver platter by our gruesome chefs! In recent years, Halloween has enjoyed a huge surge in interest with many families really going to town decorating their homes and gardens, dressing up for the occasion and generally revelling in the topsy-turviness of Halloween! At Bakehouse we know that its appeal is much broader than a night of trick-or-treating – and we have just the recipe for you! Get in touch soon to avoid disappointment.